In the centre of the city, the OLD TOWN, at about 40 minutes far from the airport, close to 24h/24 public services : metro, tram, bus, taxi; and every other kind of possible service, from parks to the chemists to restaurants, art, history, culture, and everything else at hand. At about 150m far from the famous Astronomical Clock and Old Town Square. The flat is 88sqm with 2 bedrooms, marble bathroom, internet, 52' sat TV, Jacuzzi, 2nd floor in a building with doorman, lift and CCTV . Correspondence was excellent both when booking and arriving at the apartment. Antonio showed us around the apartment and where places were for shopping, money exchange etc. 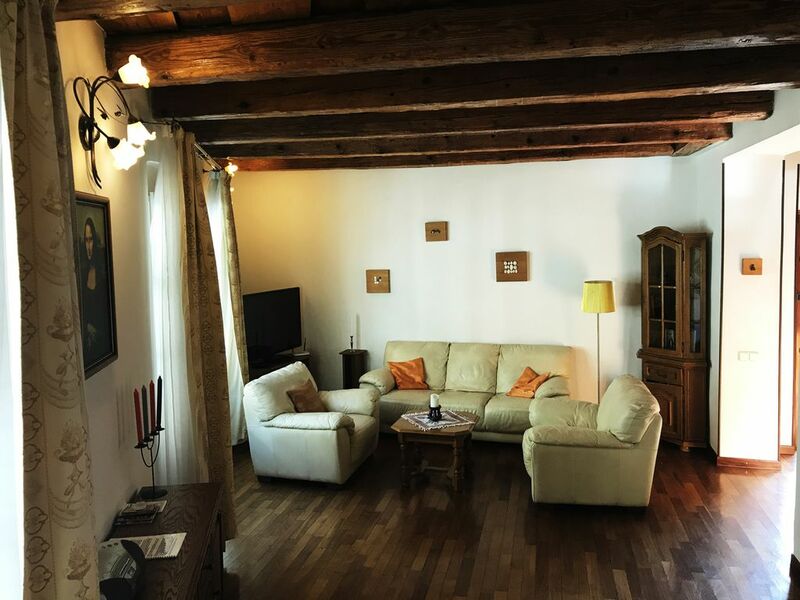 The apartment is located just off the main square and was very clean and quiet. There are pubs, restaurants, sites, shops all in very easy walking distance. Would have no hesitation to stay here again. Thank you Antonio and Valentina on a fantastic place to stay in Prague. Can't beat the location! 5 minutes walking from old town square and Charles Bridge, but on a quiet street so no noise issues. Apartment has spacious main floor and is well equipped. Bedrooms and bathroom on second level up a narrow staircase. Shower is a little awkward due to sloping roof. Tesco is a couple of blocks away for groceries, etc. Overall, enjoyed our 5 night stay and would recommend to others. Nice apt in a great location. Shower is interesting. Location is awesome. Apt is nice and spacious - spiral staircase to get to the bedroom area. Not a deterrent for us, but we just had backpacks no rolling luggage. Bedroom ceiling slants pretty low. Bed is average and adequate. The bathroom is built into the roof slant. You can not stand in the shower. It's a bath with detachable shower head. We dealt with it. This is the main reason for the 4 stars. Kitchen area is good - we didn't really use it. 4 stars for location and spacious common area. Bathroom could pose a drawback for some. Well equipped, comfortable and roomy on second level of apartment building. There are both stairs and an elevator. Two story apartment which is not made clear in description. A rather tricky spiral staircase leads to upper level. We left our largest suitcase on main level as it would have been awkward maneuvering the spiral stairs. Guide book was left for our use. On quiet street close to so very many beautiful squares,avenues, restaurants, shops. The ‘quiet’ street did become a bit noisier on Friday and Saturday nights. The young man who greeted was thorough and helpful. The four star rating is really having to do with the lack of mention of the spiral staircase as we are both over 65 and could think of very very few of friends our age (or even younger) who would have coped well with it. That being said, we ourselves would stay here again as we found it charming and quickly realized how centrally located it is. Not only in terms of tourist attractions, but for food shopping as well. Even found a salon just down a block or so and a Czech restaurant very much to our liking not a minute’s walk away. A beautiful nicely equipped two bedroom apartment in an excellent loction. Owned by Antonio and Valentina who greated us upon arrival , the apartment exceded our expectations. The two bedrooms are very roomy as is tyhe living room and kitchen area. The few things we need were supplied promptly. All in all it was a very enjoyable . We thoroughly enjoyed our stay at this terrific apartment in The Old Town. Two adults and our two teenage sons. Very clean and comfortable. Gracious hosts met us at the apartment with keys and instructions. Perfect location for The Old Town sights, restaurants, jazz clubs, and the rest of Prague. If we come back to Prague, we will definitely stay at this apartment again!